Lower your energy costs and meet changing business requirements, with 99% efficiency in ECOnversion mode. Provide excellent power quality in demanding electrical environments. Install and deploy your UPS quickly. Manage your power anywhere. 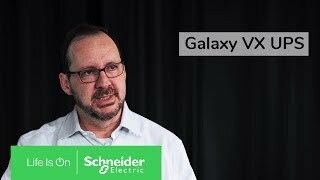 Galaxy VX supports local and remote communication via touchscreen, Web interface, Modbus, and the Schneider Electric StruxureWare for Data Center Expert solution. Click here for details about Galaxy VM Lithium-Ion battery solutions. Click here for details about Galaxy 7000's Li-Ion battery solutions. Galaxy 7000 provides secured power solutions for medium to large data centers, Industry, Buildings, Mission Critical and Shore Connection environments. The Galaxy 7000 is flexible/adaptable-its robust IGBT rectifier/inverter operates with any load (inductive, capacitive). 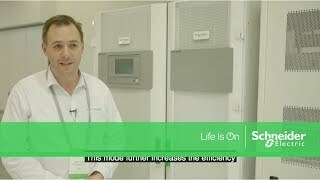 This transformerless UPS maximizes system efficiency up to 94.5%, keeping operational costs low while providing the highest power quality to mission critical loads. 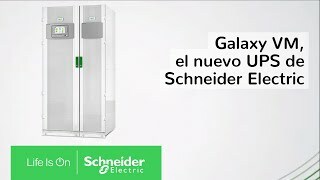 Galaxy 7000 also offers ECO Mode, with up to 99% efficiency for single & parallel systems, and Efficiency Booster Mode for parallel installations. Galaxy 7000 includes features like N+1 parallel/redundant modules with several choices, including Isolated redundant, Integrated Parallel, & Centralized Static Switch, making the Galaxy 7000 a leader with high availability architectures for mission critical environments. Galaxy 7000 also includes the Smart Power Test feature (SPoT), which reduces overall system cost by removing the need for additional load banks. Galaxy 7000 is easy to install & maintain, with only front electrical connections & fully serviceable components. Galaxy 7000 includes additional UPS solutions, such as bus synchronization boxes; IP32 enclosures; back-feed protection; frequency conversion capabilities; flexible & extended battery solutions, including VRLA, NiCad, or Li-Ion; external matching maintenance bypass cabinets; and paralleling gear. The Galaxy 5000 offers technology that increases performance and reliability. Online technology fully isolates and protects against all power quality disturbances. The upstream harmonics management allows a generator friendly installation and flexible configurations for even the most demanding designs. The Galaxy 5000 offers features such as paralleling capability for both capacity and redundancy, full front access, included start up for ease of serviceability, user friendly graphical display with multiple language options, and SNMP with network based power management options. All these features make the Galaxy 5000 one of the easiest UPS's in its class to manage and maintain. Galaxy 3500 UPS offers compact 3 Phase UPS power protection for commercial and technical facilities as well as industrial applications.The Galaxy 3500 includes dual-mains input, automatic and maintenance bypasses, and scalable runtime with hot-swappable batteries for increased availability. The parallel capability for redundancy and capacity, new optional bypass panels, and extended run battery frames provide increased flexibility. Low cost of ownership is achieved through best-in-class efficiency and a reduction in rating of electrical infrastructure - wires, transformers, and generators. The built in Network Management Card with temperature monitoring provides remote UPS power monitoring and management through a simple interface. Serviceability is greatly enhanced by user-replaceable batteries, front access servicing, and included start-up service for maximized configurability. All these features make the Galaxy 3500 the easiest UPS in its class to deploy, manage and maintain. 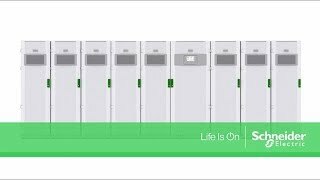 The Symmetra PX is a world class, redundant, scalable, 3 Phase UPS power protection system designed to cost effectively provide high levels of availability. 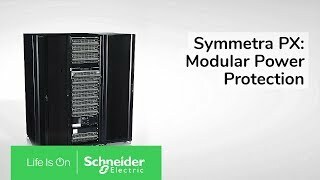 Seamlessly integrating into today's state-of-the-art data center designs, the Symmetra PX is a true modular system. Made up of dedicated and redundant modules--power, intelligence, battery and bypass, all engineered into a design that is easily and efficiently serviceable, this architecture can scale power and runtime as demand grows or as higher levels of availability are required. Symmetra PX serves as the core power train that drives InfraStruXure® systems for small and medium data centers but can also power individual "zones" of larger data centers. Highly manageable, the Symmetra PX features self-diagnostic capabilities and standardized modules which mitigate the risk of human error resulting in increased overall data center reliability. Clickhere for details about the lithium-ion battery solutions available with Symmetra MW. Symmetra MW redefines high-power UPS technology as a modular, fault-tolerant UPS in the 400-1600 kilowatt range. 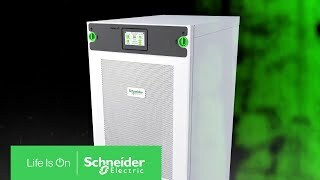 Ideal for large data centers, complete buildings, healthcare and other critical facility protection requirements, the Symmetra MW can be scaled for rigorous and changing electrical demands. Symmetra MW provides increased availability through internal N+1 configurability, predictive failure notification and multi-module paralleling features. Setting a new standard for low cost of ownership, Symmetra MW delivers best-in-class efficiency and a reduction in rating of electrical infrastructure- wires, transformers and generators. Slide-in/out power modules, manageable external batteries and self-diagnosing features greatly reduce mean time to repair, and lithium-ion battery solutions reduce battery maintenance and cost. Symmetra MW provides a customizable system in a standardized design for any large on-demand network-critical physical infrastructure.